Just can't get enough of Google? 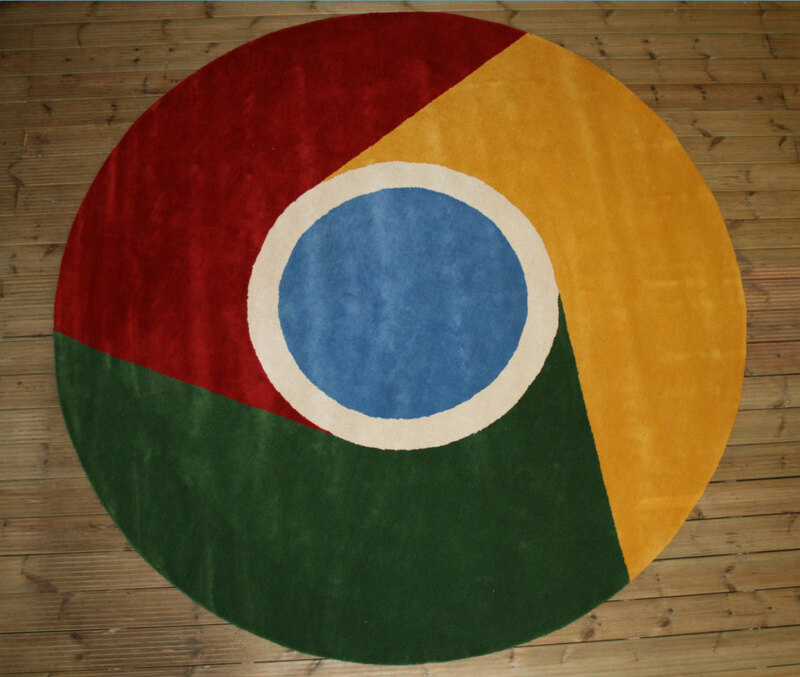 This bedroom floor rug is perfect for the techie in your life. Internet surfers of all ages will delight in the thought that they can "Google" a good nights dreams with this colorful piece. If the smell of breakfast cooking in the morning doesn't get you out of bed, maybe this rug resembling over easy eggs will. This is a comical and creative way to incorporate a rug and a couple of throw pillows. Carnivores everywhere will love this little "slice" of heaven. Designed to resemble a delicious looking slice of sausage, this rug looks almost good enough to eat. Now, where to find two slices of bread and a huge chunk of cheese! This imaginative rug is perfect for the fashionista. Created from a collection of ladies gloves, this unusual floor piece is perfect for creating an area for tea time or adding a pop of color and visual interest to the room. Sick of hunting for your slippers or your flip-flops? That is no longer a problem when you have a rug like this in your bedroom. Slip on a different pair whenever you desire and "take them out for a spin!" Old school arcade goers will be delighted to "step" into the Pac-man game each morning. 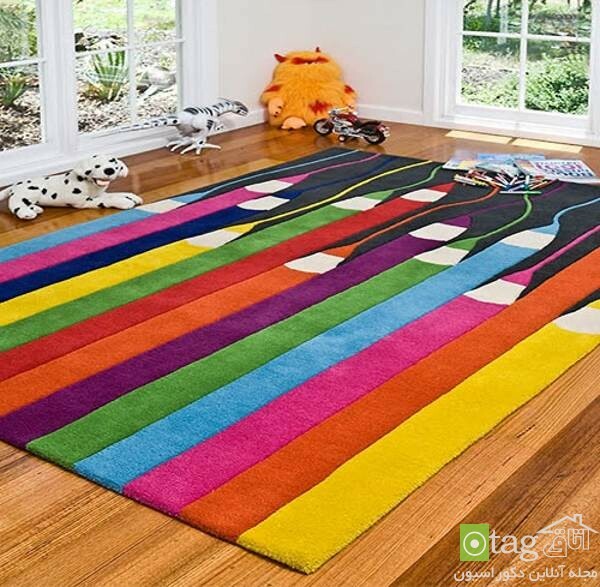 This rug will encourage flashbacks from younger years and fun-filled times in the mall arcade. The best part; you will always have two lives left! This large and colorful area rug will "lighten" up any room. The bright and bold colors and design will enhance any dull decor with interest and direction. It is the perfect bedroom rug to start your day off feeling "electrified." You will "catch" yourself falling in love with this unique rectangular rug depicting an assortment of colorful fish. There are scale shaped decorative borders and the soft assortment of colors will blend in nicely with a classy male inspired motif. Just can't seem to get to sleep? Hop out of bed, sit on the floor, and work on your rug. This clever Persian inspired piece is actually a jig-saw puzzle of individual pieces arranged in a bold and bright design. Trespassers beware when entering the room when you display this warning on the floor. 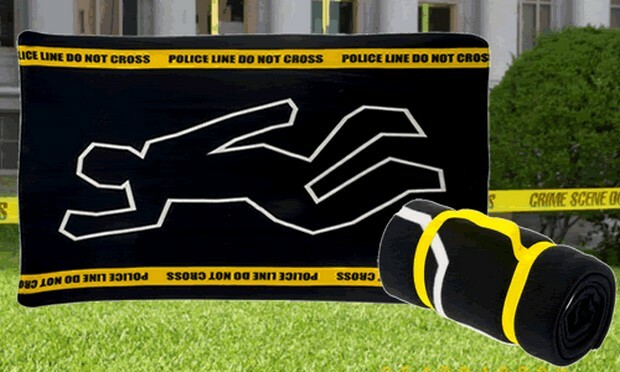 The perfect gift for the officer or detective who is hard to shop for. This whimsical and fun rug warm your feet despite the cold outline! 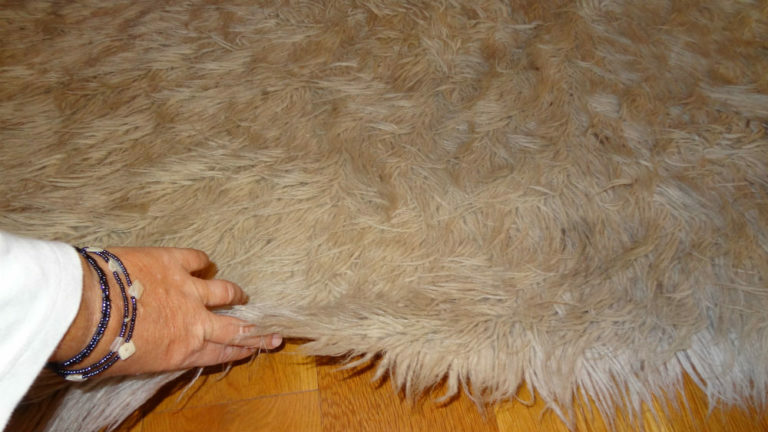 For that sci-fi nerd in your life who thought they had all of the Star Wars memorabilia possible, this Wampa rug may just top off their collection from under their feet. Bring the war to the floor of the room with this unique rug. 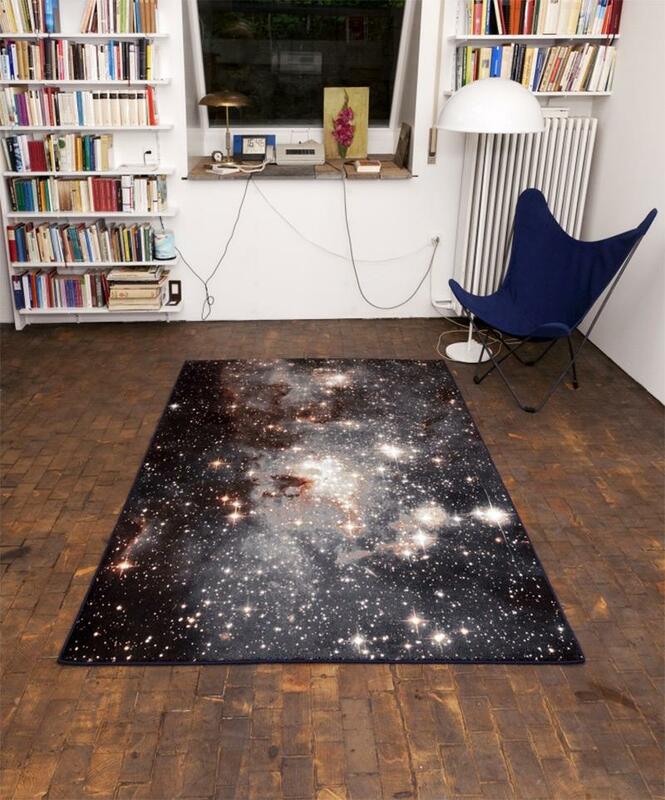 For those who enjoy spending their time looking up to the stars, this rug will finally have them looking down and back to Earth. This snapshot of the Nebula will offer an incredible astronomical view even on the cloudiest of summer nights when incorporated in a bedroom motif. Tree huggers and lumberjacks alike will love this cross section of a tree in their bedroom. Unlike the real thing, this rug is warm and soft. Bring a big slice of nature into the room with this quirky floor piece. Bring back old memories with this rug rendition of the classic Nintendo controller. The unmistakable design will bring back thoughts of sore thumbs, mushrooms, Gumbas, and hours of endless video game entertainment. Step onto the past with this rug in your bedroom. Be your own superhero when you put this Captain America shield in your bedroom. Start your day off feeling invincible when you step onto this bold and plush rendition of the famous shield. Just remember that you can't really fly. Do you know someone who has to have everything in just the right spot? Or perhaps it is someone who just can't ever seem to ever find their stuff when they need it? This bedroom rug will solve both of those issues. 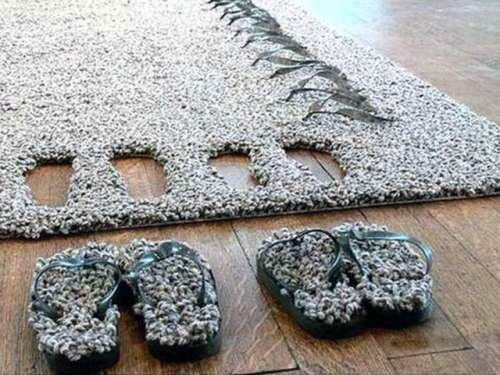 With this inventive rug, both the neatest and the messiest person will always know where to find those comfy slippers. Welcome your baby to the jungle with this themed room complete with a large area of carpeting that looks incredibly like real grass. This plush and soft carpeting is perfect for floor play time and some free exploring by baby. Everyone has heard this timeless rhyme from a parent or caregiver at some time in their lives. Now you can introduce this timeless classic nighttime rhyming ditty to your own children, grandchildren, family, or gift one to a child close to you. Pass on these warm memories of youth with this plush bedroom rug. Bring some peace and color into the bedroom with this inspiring rug. The multiple colors will blend with any decor and show off your love of your fellow man and harmony. Feel the love each morning as you step out of bed and on to this bright and cheery rug. Whatever vintage of wine your favorite may be, wine lovers of all tastes and dates will "drink up" this libations inspired cork print rug. 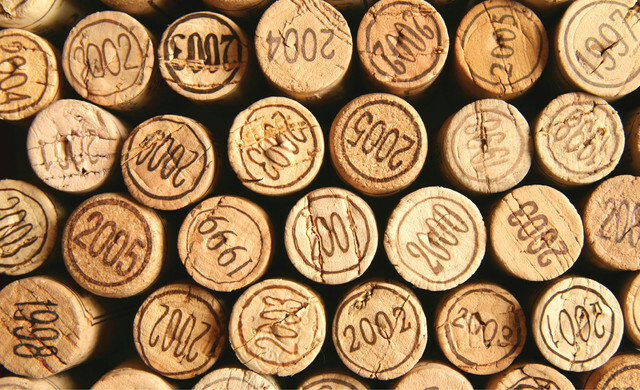 These vintage corks with various years will bring back memories of great wines of the past and conjure up thoughts of the great vintages yet to come. This unfortunate roadside rodent inspired rug will bring some whimsy to a cabin bedroom or teasing chuckle to an unlucky motorists domain. 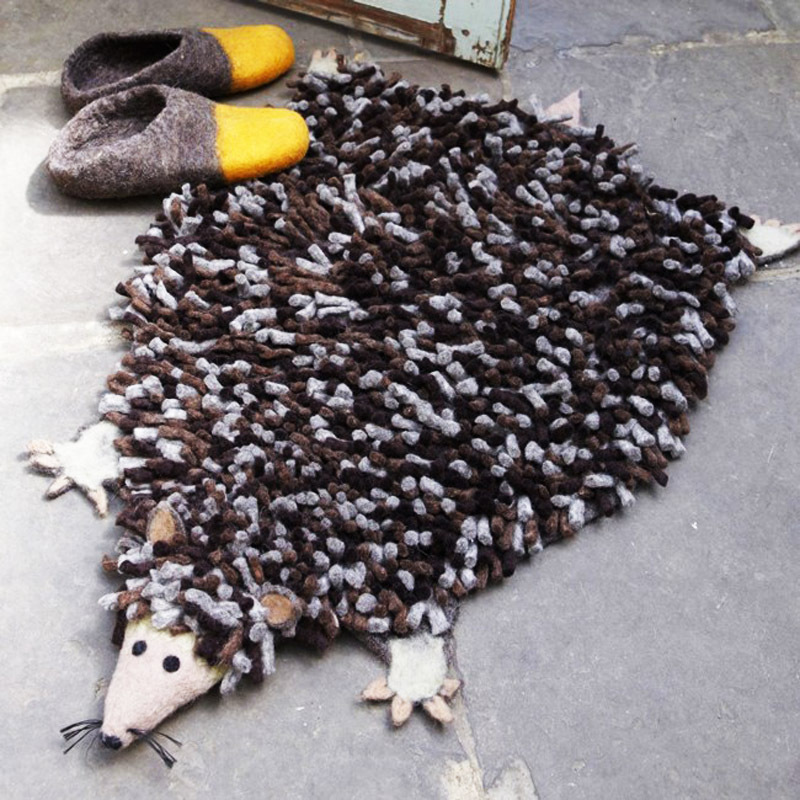 Created from artfully crafted felt tubes, this humorous road-kill rug is far less smelly than the real thing! There is nothing like the luxurious feeling of fur. With one of these leather and fur rugs, your feet can now also indulge in the lavishness. Give your feet a taste of the high-class life with one of these rugs to run your toes through. Make your feet feel like a million with this rug choice. This rug is a reminder that the scale is our friend. Or is it? Great as a supportive gift for a successful weight loss friend. This rug will have you thinking on the right track first thing in the morning. When it comes to decorating your most private of areas, the bedroom, the choices are endless. Paint colors, fabrics, curtains, and bedding are all elements that are high on the list of considerations for enhancing a room's appeal. With the perfect bedroom rug, you can complete the look with a rug you can sink your toes into.